Emilie Conter 🇧🇪 & Fragile van’t Paradijs won the €24,600 Super Cup Grand Prix CSI 2* presented by Gemeente Meise last Sunday during the Brussels Stephex Masters CSI 2* in Belgium. 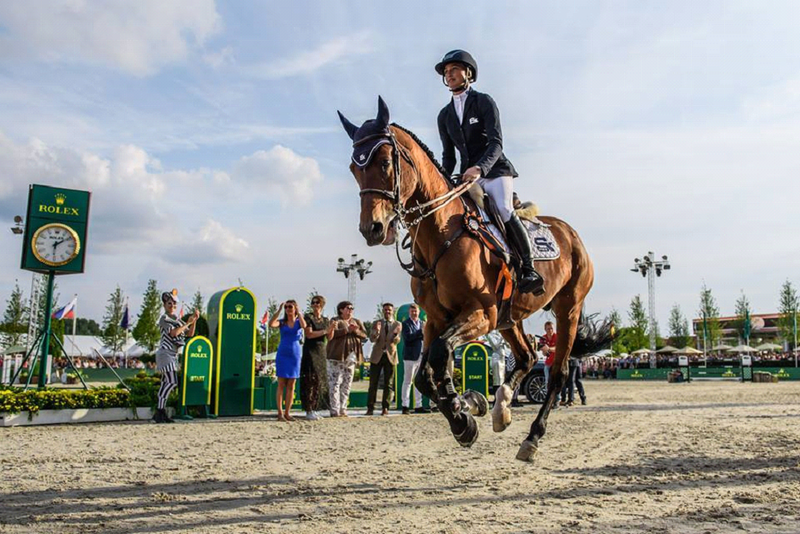 The young Belgian who rides for Stephex Stables and the 12-year-old chestnut Belgian Warmblood mare (Indoctro x Surrealist van’t Paradijs) were one of the only four combinations that had qualified for the jump-off. The winning duo cleared all the obstacles set on 1.45m track once again, securing the victory in 44.15 seconds. Ross Mulholland 🇮🇪 & Cybell (Varo x Lancer) had victory taken away by the last duo to enter the ring, thus finishing second with no penalties in 44.72 seconds. Annette Wolf 🇳🇱 & Ewoud J (Tangelo van de Zuuthoeve x Burggraaf) reigstered the fastest time among the finalists, but one pole down in 42.20 seconds meant that they would have to settle for third place. “There was only one other clear when I was going in as last, and the round was quite fast so I tried to go as quick as I could but still stay clear. It worked out, and I am really happy,” smiled the 17-year-old daughter of Stephan Conter – President of the Brussels Stephex Masters. “My horse did an amazing job today. She is a bit special, but she always fights for me in the ring and does everything she can for me,” said Emilie about Fragile van’t Paradijs that also won Friday’s Super Cup. “It is really nice to win here at home. My sister won this Grand Prix two years ago, so it is really special for me to win today!” said a smiling Emilie.